Minnesota vs. Nebraska Game Thread ETC. Minny has found the going tough in B1G play. it will be interesting to see if the all world coach can turn them around after a few years. Since Whalen is a Minnesota person I would assume she will have a lot leash than the prior two coacheds did. From what i saw watching Min. play this year....think we'll win it. It's a home game. We must have someone step up for 15-20 points. Need the leadership of a scorer., to infect the rest of the team with offense. Taylor doesn't shot enough. We don't seem to have figured out how to use Cain effectively. Passing in from the perimeter doesn't fit her skill set. Possible solution: Drive into the lane and pass off to her. She's usually deadly form inside the lane once she has the ball, but not real quick to make moves. May sound dumb...she should have been red shirted. But at 6-5 ...how do you let her ride the bench. But...another but...needs to have some one school her (and even the staff) on post play. Hire a tutor over the summer...what ever. I wish we did more driving and dishing. We usually, take it to the hoop, for the shot (with limited success). Kate, is one of many, that would benefit. Maddie has always shot well from the lane. Brown is deadly mid range. Can't think of a player that isn't effective from free throw line in. Now, setting up those shots? That's why coach makes the big bucks. Would Minnesota have been ranked so soon if they had hired someone other than Whalen? Seems that ESPN has quite the love affair with her as a player and a coach. I get the love affair as a player, but until she gets her feet more wet and proves herself as a coach, I’ll temper my enthusiasm. Not saying she won’t be a good coach, I just don’t think she’s there yet. Like someone said, Minnie was a good team for the past few years - it’s not like she inherited a giant mess with single digit season wins. On TV (ESPN2). It would be a good time for us to have a 'Breakout' Game when everything comes together (on National TV). I like our chances! (I think we all do). We know the Huskers Never Quit! In the illy game we started to see a little more of the driving and passing off with some success. Just need more of it. People playing under control. Like stated earlier, ESPN and the Minnesota fan base seems to think Whalen the player = Whalen the coach. Minny gets a lot of love because of that. People watching at home will be sick of the Whalen slobberfest by the end of the game. And as stated before Can Whalen get Minny tured around. Sure the previous two coach did well, But Minny fans think Whalen is the end of all ends. kinda Scotty Frost with the Husker football team. anyone else watch the minny-iowa game? the first half was kind of the minnesota i expected. 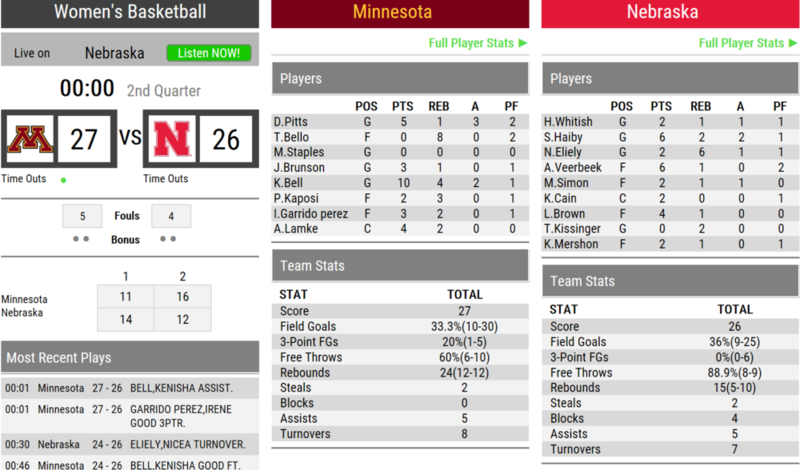 good defense (except on gusty, but, not many shut her down anyway) and minny started hitting the 3's again. from what i read, minny hasn't shot the ball well recently. 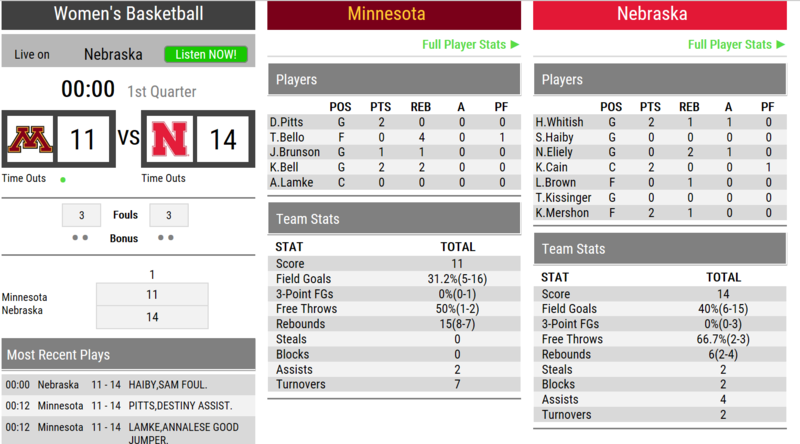 iowa made some adjustments and played a better second half and jumped on minny. minnesota's defense can give huskers some problems. most of them are pretty quick and can swarm the ball. they can get out and run with the ball, too. not going to be an easy game. pitt's has started hitting 3's again and bell can take over a game. bello can rebound a has been pretty decent around the basket. lamke has been having her moments at the post, too. minny just got done spanking wisconsin at madison. wont's surprise me to see a back and forth game. Just glad the weather cooperated, except for being too dang cold, so I can get down to watch in person. We need to contain their shooters and rebound. Game program has Mershon as the probable starter. Whew; Just got my Husker Uniform on just before the Tip! I guess if you double travel it's ok and Refs won't call it! First quarter I’ve watched in conference play. More freshman need to start. We're not hitting shots very well early ...but still ahead at the end of 1st. Minn makes lot's of ....poor skills mistakes. Thanks Minn ! Gotta love Verbeek as a bBall player...she's got "it"
I guess it's the Fourth Travel that does it for the Refs before they call it..
All the better for us. I would start the 4 freshman and Eliely. I chose her because I like her D and I think we need it to start the game.